Goddess Lakshmi is personified not only as the bestower of fortune and wealth but also as an embodiment of loveliness, grace and charm. 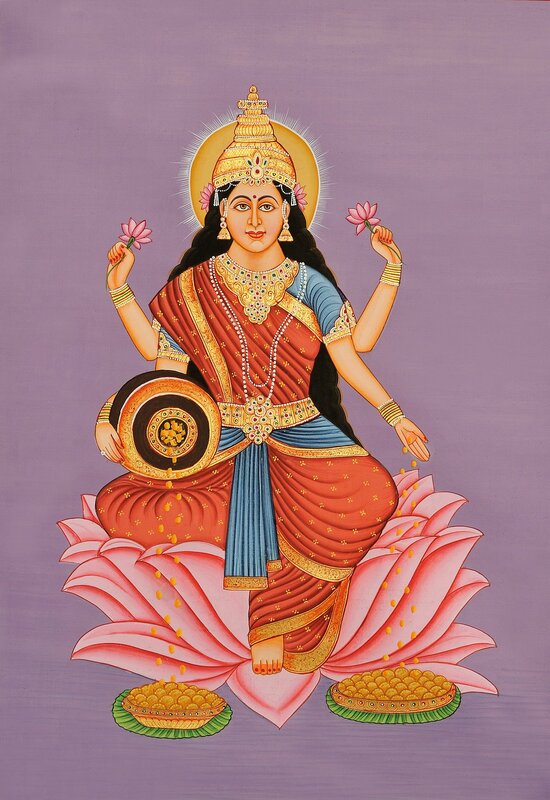 She is the goddess whose presence in any home or establishment is said to ensure continuous prosperity and peace. Iconographically, Goddess Lakshmi is described as a fair lady, generally with four arms, seated or standing on a lotus, dressed in fine garments and precious jewels. She has a benign countenance, is in her full youth and yet having a motherly appearance. The most striking feature of the iconography of Lakshmi is her persistent association with the lotus. The meaning of the lotus, in relation to Goddess Lakshmi, refers to her purity and spiritual power. Rooted in the mud but blossoming above the water, completely uncontaminated by the mud, the lotus represents spiritual perfection and authority. Two divine characteristics of this supremely popular goddess.